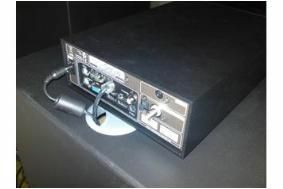 BRISTOL SHOW 2010: Naim develops prototype UnitiServe music server | What Hi-Fi? Called the UnitiServe, it's a prototype music server in a UnitiQute-sized box. Inside the box is a 1.5TB hard drive to which you can rip CDs in full resolution, as well as store and play 24-bit/96kHz .wav files. A single CD takes about 6-7 minutes to copy. It uses similar software to Naim's £4500 HDX system, and can be controlled from any web browser, via a laptop or an iPhone app. You can browse music stored on the UnitiServe by album, artist, playlist or genre and content can also be transferred to a network attached storage device (NAS). There's no price for the UnitiServe yet, but Naim expects it to be on sale by June/July this year. And if you want to hear the UnitiQute in action, it's being demonstrated in the Naim rooms here at the show (502, 506, 509).